Through Medi-Weightloss in Berwyn, individuals gain the incentive, support, and resources they need to achieve their long-term wellness goals. Every year, as the calendar turns from December to January, Americans embrace the time-honored tradition of making changes for the better—such as cutting out bad habits, embracing exercise, or, most commonly, shedding unwanted pounds as a way to improve overall health. While many of these resolutions become distant memories by February, individuals who fulfill their commitment often do so by enlisting the help of professionals who are devoted to helping others succeed. Since Medi-Weightloss opened its doors in December 2009, its patients have experienced some truly incredible results: In all, Medi-Weightloss patients have dropped more than 90,000 pounds, according to Rose. Besides relieving the physical and emotional burden of unwanted pounds, the Medi-Weightloss program can also help men and women curtail, combat, or prevent serious diseases related to excess weight—namely, heart disease, high blood pressure, sleep apnea, and diabetes. 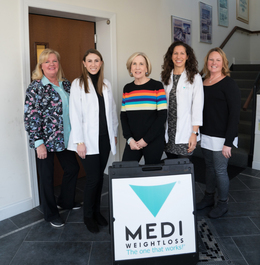 At Medi-Weightloss’ facility in Berwyn, patients interact with licensed medical practitioners, including two Nurse Practitioners, three Certified Medical Assistants, and a Physician Assistant. Each treatment plan, which is customized to the individual, can be broken down into three distinct parts: the acute phase, the short-term maintenance phase, and the wellness phase. Individualized attention starts the moment the patient steps onto a Tanita digital scale, which provides a detailed analysis of the individual’s weight, including factors such as body mass index, water content, and body fat. The patient then meets one on one with a staff member to determine a path forward. While each patient is unique, certain tactics can be applied to most cases. For example, most individuals follow a modified ketogenic diet. This restriction in the consumption of sugars and carbohydrates stimulates ketosis, the metabolic state that enables the body to use its own fat as its principal source of energy. Likewise, most patients are asked to keep a food journal, which is reviewed with Medi-Weightloss practitioners at weekly visits, so the individual’s diet can be modified, if needed, to promote weight loss. Once a patient enters the wellness phase, he or she is encouraged to visit the office monthly. This, Rose says, is where the true long-term success of the Medi-Weightloss program shines. As the Berwyn office is the only Medi-Weightloss clinic in Pennsylvania, individuals travel from far and wide to access the office’s services. The regularity with which patients visit the office not only ensures accountability but also maintains the close, personal relationship between patient and staff. Of course, the team at Medi-Weightloss understands that healthy living requires much more than simply monitoring one’s diet and encouraging physical fitness. In fact, one of the Berwyn clinic’s most remarkable offerings is counseling, as a way to help patients through the process. In addition, Ott says learning how to prepare meals effectively is one of the keys to maintaining a patient’s commitment to a healthy lifestyle. Even so, she says busy work schedules and other commitments can make meal prep an ongoing challenge. That’s why the Medi-Weightloss program offers recipes to teach patients how to prepare healthy, easy-to-make, and flavorful meals that use only a few ingredients. Insurance companies have come to recognize the tremendous value associated with the kinds of services provided by Medi-Weightloss, which, incidentally, became credentialed by most major insurances approximately two years ago. In other words, now that such weight-loss programs are covered by insurance, patients have more incentive than ever to take the initiative and regain their health. 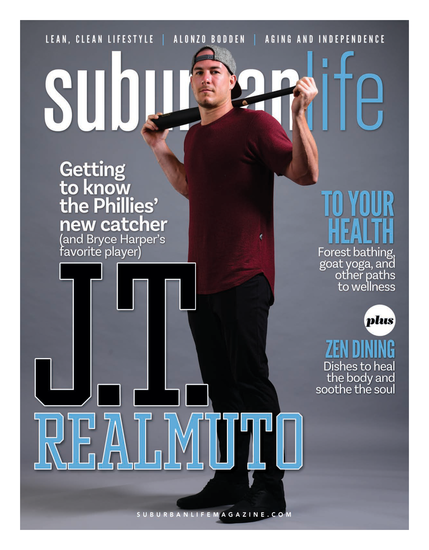 Published (and copyrighted) in Suburban Life magazine, January 2019.